Schneider Electric announced the completion of its acquisition of Invensys on January 17, 2014. The acquisition of the €2.18billion ($3 billion) software, automation, and controls company will enhance Schneider Electric’s position as a solutions integrator, especially for automation in the process and power generation industries. The merger should create synergies between the two companies’ software for energy automation, industrial automation, and process automation, while also providing a wider service base for its customers as the combined company will be able to reach more market segments throughout the world due to the minimal overlap of markets and customer base. Jean-Pascal Tricoire, Chairman and CEO of Schneider Electric, and Clemens Blum, Executive Vice-President of the Industry business unit both commented on the complementary technologies and capabilities of both companies and the potential value to their customers worldwide. At their recent Orlando Industry Forum in Orlando (FL USA), ARC Advisory Group met jointly with leaders of both firms. Just weeks after beginning to collaborate, both firms talked about their high degree of cultural match, and voiced optimism for the merger as a growth deal, rather than acquisition of an installed base. While clearly stating that Invensys developments and operations will continue, there are strong areas of shared knowledge that ARC expects to benefit both companies. How will this translate to plant owner/operators, especially those who have been using Invensys products for many years? How well will their investments be protected? How will Schneider Electric position and use these products going forward? Invensys’ large client base will need to hear specific and unequivocal answers to these questions before moving forward and extending their commitments to the newly merged organization. From Schneider Electric’s perspective, the Invensys acquisition augments its business in industry and infrastructure by boosting its positions in key process segments and strengthening its software for operational efficiency. The company cites that industrial automation is a strategic and attractive business for the firm. As a global specialist in energy management, the solutions of the Schneider Electric Industry business unit are a key part of its portfolio. The Invensys assets help the company better address owner/operators’ challenges relative to productivity, input costs management, workforce scarcity, wage and raw material inflation, complexity of production constraints, and sustainable development. Invensys is a global automation player with large installed base and a major software presence. The company has strong credibility with end users in the refining, chemical, power, pharmaceutical, and food & beverage industries. The company has a strong software business, with particular strengths in HMI/plant intelligence, simulation, optimization, and asset management. It brings major brands in process automation and safety and global reach in process automation, safety, and instrumentation systems via its Foxboro, and Triconex brands. The Eurotherm brand adds temperature and process controllers. In industrial software, Invensys is a major supplier, including design, simulation, optimization, operations management, and asset management via its Wonderware, SimSci, and Avantis brands. Except for parts of the Wonderware portfolio, these brands will fill obvious gaps in Schneider Electric’s process offering. With Invensys, Schneider Electric becomes a leader in process safety via Triconex process safety and critical control systems. Schneider Electric gets a DCS offering with a large installed base via Foxboro, which has significant brownfield expansion potential. Schneider Electric can expand this potential with its own portfolio of low and medium voltage drives, motor control, and smart infrastructure intelligence. The company also gains domain expertise and execution capabilities in key segments, including refining, petrochemicals and power generation. Schneider Electric will no longer be viewed largely as a strong factory automation company. With Invensys, it clearly becomes a strong process automation company as well. Even more to the point, the combined software and product portfolio will provide a far more complete suite of converged automation and power solutions. From ARC’s perspective, Schneider Electric’s acquisition of Invensys will be a positive development for owner/operators. Owner/operators would not have been as well served had Invensys been bought by a direct competitor focused more on its installed base, which would have introduced significant product redundancies and might well require expensive and painful migration. Also, some owner/operators were uncertain of the long term prospects for Invensys remaining independent. That uncertainty can now go away. Schneider Electric has a strong balance sheet, a long-term commitment to industrial automation, and a very good track record with industrial acquisitions. The joint entity is also in an excellent position to supply the converged solutions in areas such as power and automation that many of today owner/operators seek. Owner/operators, however, will want to see action and proof points to see how well this acquisition is being executed and how well the firm integrates its platforms to exploit obvious synergies. ARC recommends that owner/operators should actively participate in the company’s upcoming customer conferences, looking for both continuity and a combined vision showing solutions that leverage both Invensys’ process solutions and Schneider Electric’s power and energy management solutions. 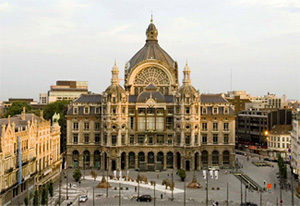 ARC Advisory Group’s 9th Process Management Academy (PMA) took place in Antwerp (B) from March 4 to 5, 2013. Overall, ARC Advisory Group had more than 100 participants who shared their experiences and took the opportunity to network. The forum included presentations from Euriware-Areva, Siemens, Bayer Technology Services, SAP, OMV, HIMA, Microsoft, ExxonMobil, and ARC, among others. The following topics were addressed:· Continuous vs. Batch: How Technology Helps Us to Rethink Traditional Production Methods; Real-time Process Feedback; Energy & Material Efficiency Optimization; Enterprise Asset Management in the Regulated Industries. Among the highlights were four workshops dealing with Cyber Security, Big Data & the Cloud and Managing Process & Product Data in the Information Age, 3D Simulation & Training in Process Applications, and Optimizing Supply Chains & Demand Response. In these workshops, suppliers and users shared their experiences and needs with respect to products and applications. One of the hot topics at the Process Management Academy 2013 was cyber security in industrial control systems (ICS). The well attended workshop showed that the interest of companies for solutions to protect themselves from cyber attacks is increasing. Within the last few years the amount of reported cyber attacks on the ICS of companies has increased significantly. Also the quality of incidents has changed dramatically. In the past most of the attacks were committed by “script-kiddies” or amateur hackers and the targets in most cases were office IT systems. Nowadays an increasing number of attacks on the industrial infrastructure takes place. While office IT systems can be rebooted, reinstalled and the biggest loss is (leaked) information, attacks on ICSs pose a different risk. On the one hand organizations close to the governments may have the ability to perform such attacks. On the other hand rival companies or competitors also have the knowledge. Another source of threats may be (former) employees or (sub-) contractors who could have grudges against their former employer and mean to harm him or sell or gain confidential information, said ARC Analyst Stefan Miksch. • See also our ICS & Scada Security Page! Immersive training simulation (ITS) is a form of modern training using 3D models of a process plant where the user can directly control the avatar, giving him the perception he is part of the environment. To train field operators and maintenance personnel of industrial process plants, it is more effective to provide them with a 3D simulation environment in which they can virtually move around, make decisions on their route and their interactions with equipment, than showing them a movie. Someone trained using ITS, has a ‘déjà-vu’ experience when seeing the real plant. Some ITS propose head-mounted devices, 3D projection within a ‘cave’ to make the experience more realistic. These measures increase the cost of ITS, and are not necessary for the immersive experience that can be realized on a flat screen of a standard PC. A recent trend is to couple traditional operator training simulation (OTS), based in high-fidelity dynamic process simulation, where an operator operates a virtual plant behind a virtual console, and while simultaneously the field operators experience the plant changes on instruments in the simulated field. What do Big Data and the Cloud Mean to the Process Industries? At the workshop to explore the impact of Big Data and the Cloud a panel of experts from Siemens, SAP, Microsoft and independent consultant Klaus Koch set the tone for discussion with statements about what Big Data means in the process industries. One cause of “Big Data” is the digitalization of information that used to be stored on paper. For process users, this means CAD drawings of facilities and process documentation. The move from 2D to 3D CAD caused a leap in the size of CAD files, as does the integration of images created with 3D laser scanners. At the same time, system configuration data for DCS, field devices and engineering and operator stations have grown explosively. Finally, data recorded for operator training and simulation means huge, unwieldy files have to be stored, archived, retrieved and managed. The Cloud is a solution for Big Data that will play a growing role for process users in the near future. The “public” Cloud is simply any public area on the internet where data can be stored and viewed. This includes social media sites and blogs. A “private” Cloud is data center, usually off-site, that either belongs to the process user’s organization or is operated on the organization’s behalf by a service provider. The workshop attendees brought in views from a variety of end-user industries to discuss which data belong in the Cloud and which data should be handled locally. It was agreed that all mission-critical data should be stored and handled onsite, while other data, such as product schedules that are shared with supply chain partners, would be good candidates for the open, but secure, environment of a private Cloud. The most futuristic discussion at the 2013 PMA was the one in the workshop on “Supply Chain Optimization and Demand Response”. The main theme in the discussion was the challenge to deal with the constant urge to produce smaller batches and react fast to consumer demand. The workshop was kicked off with an obligatory Henry Ford quotation: “Any customer can have a car painted any color that he wants…so long as it is black”. This comparison to the good old days showed the difference between the variations of the Tin Lizzy and modern cars, such as the Opel Adam (60,000 variations for the outside, 82,000 for the interior). So, what are the next steps? Production in containers is currently tested but not likely to have a broad impact on the landscape within the next 5 to 10 years. PAT is already changing the pharmaceutical industry today. Single use technologies are also enabling shorter response times in batch processing – especially in the pharmaceutical industry and bioactive materials – where they are established, but still an emerging technology. Micro reactors also have the potential to change manufacturing as you know it today; here a similar system of modularization and scaling up in numbers is used. The technology is available today, but there are still technological issues to solve. In the future, 3D printing can alter the manufacturing landscape fundamentally – ARC has published various reports on this topic. Research shows that at some point in the future micro reactors can be printed by 3D printers … imagine that you can print a chemical plant in 50 years. Looking at the market dynamics and technological challenges ahead, profitability and efficiency in the process industries will surely keep everyone busy until ARC Europe’s next year’s event. 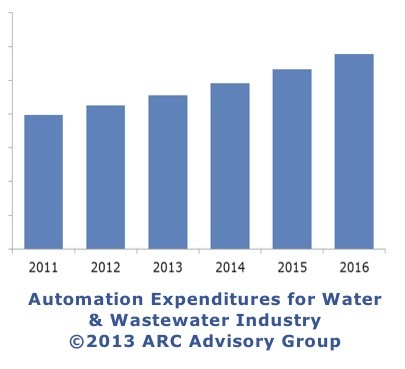 ARC believes that the water & wastewater industry represents one of the greatest opportunities for the automation business through the next 20 years. Throughout much of the developed world, including North America, Western Europe, and Japan, the existing water & wastewater infrastructure is aging rapidly and often suffering from neglect. Increasing demands upon the aging, shrinking, internal workforceAutomation suppliers can play a major role in providing solutions to overcome the above challenges. Pressure transmitter shipments, after returning to pre-recession levels in 2010, saw strong growth in 2011, even surpassing 2010’s growth by several percentage points. Despite the return to positive growth, risks remain. In a connected world, market volatility and political instability impact industrial growth, which in turn affects the pressure transmitter business. The relative slowdown in China and India further increases the risks facing pressure transmitter vendors. Due to the numerous challenges and the lag between orders and final shipment for new projects, many vendors are weighing the financial viability before investing in their manufacturing capacity and after-market service capabilities. According to G. Ganapathiraman, Country Manager, ARC India and co-author of ARC’s study titled Pressure Transmitters for Asia Market Research Study , “Ongoing financial instability continues to plague markets in Asia. 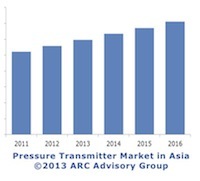 However, ARC expects the developing countries such as China and India to drive the majority of Asia’s growth in pressure transmitter shipments going forward.” Countries such as Indonesia and South Korea are also growing at above average growth rates. Despite the country’s slower GDP growth in recent quarters, the electric power industry in China continues its investments, creating opportunities for pressure transmitter suppliers. In India, the need for both increased generating capacity and a more stable power infrastructure to reduce brownouts drives the need for more pressure transmitters. The oil & gas, electric power, chemicals, and metals & mining industries are leading for the deployment of pressure transmitters. Among these, the metals & mining industry is experiencing above average growth. Asia’s ongoing demand for energy will require more oil and gas, driving demand and long-term energy prices. Finding new oil deposits is becoming more difficult and those that are found tend to be more challenging to develop. Many of these new oil fields produce heavy oil rather than lighter sweet crude oil. The high sulfur content increases refining costs and requires different refining methods. This will spawn investment in new refineries capable of refining the heavy oil deposits in the Asia Pacific region. At the same time, environmental concerns are increasing, creating significant opportunities for pressure transmitter suppliers in the oil & gas industry. Increasingly tough safety and environmental regulations have helped drive increasing adoption of safety integrity level (SIL)-rated transmitters for safety instrumented systems (SIS) to mitigate the risk of catastrophic events. Pressure transmitters are an integral part of safety instrumented systems, and most leading pressure transmitter suppliers now offer SIL-rated transmitters. After a slight stumble in 2010 in the wake of the global recession, the worldwide flow meter market has rebounded strongly, growing at double digit rates through 2011 and 2012 as suppliers fulfilled pent up demand in the power, mining, and oil & gas industries. “Sales of major flowmeter technologies will continue to move at brisk rates going forward, driven by increased business in the chemical and energy sectors. 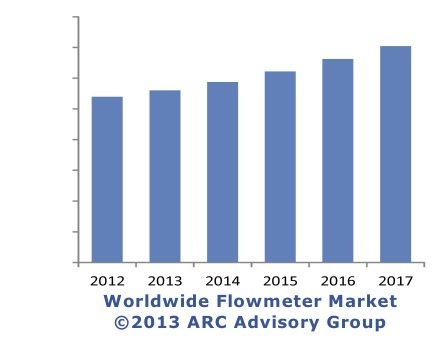 Flowmeter suppliers will benefit from investment and expansion activities, and they have aligned their business goals to capitalize on growing industry segments and geographic regions that will enable them to increase market share,” according to Senior Analyst Allen Avery, principal author of ARC’s “Flowmeter Global Market Research Study”. The energy sectors will see the strongest growth in the years ahead. Oil prices are on the rise again with the economic recovery, increased demand, and political and social unrest in the Arab world. This should continue to drive demand for flowmeters going forward, as higher prices favor increased exploration, production, and processing of fossil fuels. Also, the need to bring refined fuels to growing markets in Asia will drive construction of pipelines and fuel terminals, increasing demand for custody-transfer capable flow measurement devices. Mining will also see steady growth if commodity prices hold. North America will see strong activity, particularly if oil prices remain high, justifying continued investments in oil sands projects in Canada. The unfolding shale gas plays in the U.S. will also present suppliers with significant opportunities in the coming years. In the EMEA region, growth will be driven by oil and gas projects in the Middle East and Africa, as well as investments in refining capacity and liquefied natural gas (LNG) processing and loading facilities. Asia will continue to be the engine of global growth as new construction in the power, oil and gas, and water and wastewater sectors continues as the economies in China and India advance, and demand for consumer goods and transportation increases. Latin America, though the smallest global market for flowmeters, will nevertheless see strong activity in oil and gas exploration and production, mining, and renewable fuels over the next several years. The control valves, actuators, and positioners market in India is largely driven by process industries, which are under multiple pressures: to improve energy management; adhere to standards and regulations; streamline production processes; and reduce costs. Economic instability and exchange rate fluctuations caused some uncertainty in 2011 but the market is still growing. India’s domestic demand driven market propels rapid industrialization and economic growth. Growth is further regulated by monetary and fiscal policies. While the economy of India has slowed down due to weakening external demand, the robust domestic demand continues to remain strong. Due to its domestic-demand-driven economy, India has emerged as one of the fastest growing economies in the world. According to ARC Advisory Group’s research, the total control valve, actuator, and positioner market in India will register CAGR of over 7.5 percent by 2016. ARC’s latest study, “Control Valves for India Market Research Study” provides an in-depth analysis of the control valve, actuator, and positioner business in India. In addition to market analysis and forecasts, the study also covers the current market nuances, strategic issues, and the future outlook. The report also highlights the factors that influence the control valve market in India and its dynamics. The country not only acts as a good demand-centric market, but also as an excellent manufacturing base that can serve the growing markets in the region. While the market offers opportunities, the suppliers’ strategies ultimately contribute to success in the marketplace. Suppliers should understand the market nuances, identify emerging opportunities aligning with the overall corporate objectives, and develop their growth strategies.